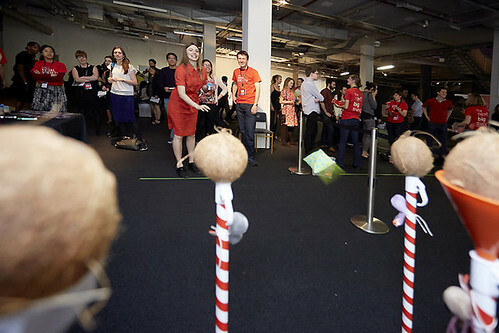 Some photos from this summer's Science Museum Lates event with the Royal Society and the Cheltenham Science Festival. Thanks to everyone who helped: Liz Batty, Phelim Bradley, Jane Charlesworth, Dilly De Silva, Sarah Earle, Nicki Fawcett, Jess Hedge, Brian Mackenwells, Amy Mason, Charvy Narain, Anna Sheppard and Jessie Wu! We had two activities. Dance Dance Evolution is a computer game which uses an adapted dance-dance mat with four squares representing bases in the DNA (A, C, G and T). 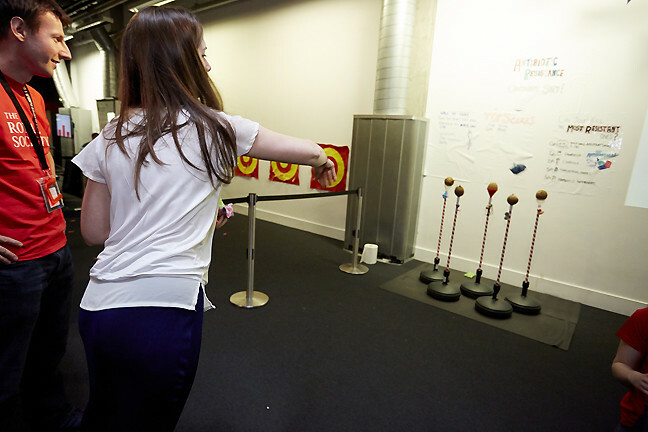 Participants act as the DNA replicator, and mistakes cause mutations in the DNA sequence. The next dancer copies the sequence left by the previous dancer, demonstrating evolution by mutation over time. The game shows the percentage similarity of the current sequence to the original sequence, showing the amount of 'evolution' over the time period of the game. We discussed with visitors the relevance of this to the development of antibiotic resistance. 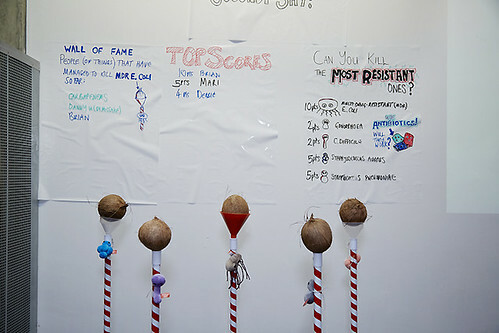 Our second activity was a coconut shy game, which shows how antibiotic use can select for resistant bacteria. Participants throw bean bags (i.e. antibiotics) at the coconuts (i.e. bacteria) to try and knock (i.e. kill) the coconuts, painted as bacteria, from the shy. However, the antibiotic resistant bacteria (those on the back row) are much harder to knock off. When the susceptible bacteria are knocked off, the frequency of the resistant bacteria increases, displaying how the use of antibiotics can increase the frequency of resistant bacteria. Ashleigh Griffin's group also had an awesome stall!